D24. 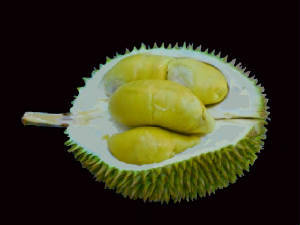 Also known as Sultan durian or "Bukit Merah". 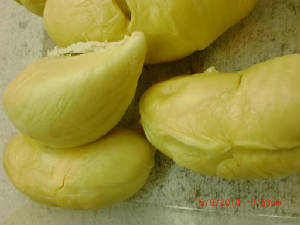 This is the most popular durian in Singapore. This clone was originated from Bukit Merah Reservoir, Perak and registered by DOA on 30 November 1937. It is oval in shape, of average size, weighing between 1 - 2.8kg. per fruit. The skin is green to brownish green and the thorns are sharp and thin. The flesh is yellow, thick and sweet. Some a bit bitter. Most has big and cracked seeds. D24 took about 105 – 115 days from flowering to maturity and fall. The price of D24 range from 50 cents to three for $10 (normally for low quality or overnight fruits) to $6 - $12 per kg (for premium quality) D24 was planted throughout Malaysia . Most plentiful at Bentong, Pahang, Northern Part of Johor and Perak. Dry, Thick, Fragrant & Delicious! 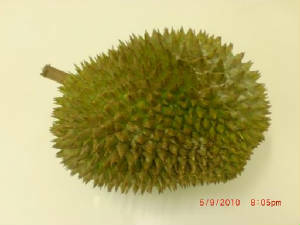 This D24 is also known as Sultan Durian. The oldest trees and the best species are like heirloom to the farmers. They are reluctant to sell them. Such durians are only for own consumption and for VVIPs - like the Sultans.